"The easiest and best seitan recipe I've ever used. You can use this recipe wherever meat is called for, shape it before cooking to make nuggets or patties, and after cooking you can grind or shred the 'meat' to fit whatever the recipe calls for. 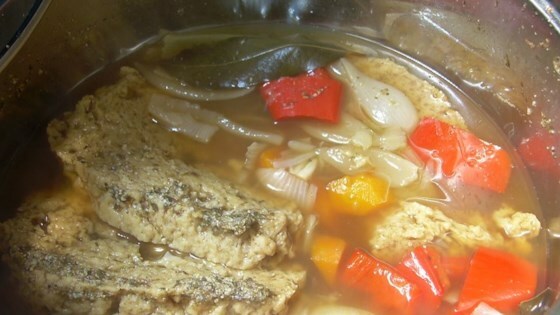 This recipe has a slight chicken flavor, but if you want it to have more of a beef flavor, just add beef bouillon or soup-mix to the liquids in your broth. Seitan soaks up so much flavor, the possibilities are endless so go ahead and experiment with your favorite seasonings." In a large glass bowl, mix together the vital wheat gluten, rosemary, thyme, sage, cumin seed, and garlic powder. In a separate bowl, combine the water and tamari or soy sauce. Using a sturdy spoon and working very quickly, gradually pour liquid into gluten mixture. The gluten will develop very fast and become very rubbery and elastic. If there is any remaining dry mix, quickly add a small amount of water to soak it up. Working on a flat, clean countertop, knead the dough a few times then shape into a log about the diameter of your fist. Shaping the dough can be a little tricky as it is rubbery and resistant, but just be patient. Set aside to rest for 15 minutes while making stock. In a large stock pot, boil 8 cups water with 1/2 cup tamari or soy sauce, onion powder, and dashi kombu. Cut gluten log into desired shapes, maximum 1/2 inch thick. Individually drop the gluten pieces into boiling stock. Reduce heat to low, cover, and simmer for 45 minutes. Seitan may now be breaded and fried, chopped up and used in salads, or seasoned in any way you like. The seitan is much less 'spongey' if you put the seitan in cold broth and then bring it up to a simmer instead of dropping it in boiling broth. I will say that it had excellent flavor, it soaked up so much into it. However, it came out very spongey, not quite seitan. I will try a second batch another time and see how that on fairs. This turned out very tasty -- I was quite pleased by the flavour. I look forward to making this again. this was wonderful! my partner absolutely loved it!